A team of researchers studying dark matter noticed a strange trend in the brightness of the satellite galaxies around the Milky Way. There seem to be two classes of these orbiting dwarf galaxies—dim ones and bright ones—with few in the middle range. The researchers propose that this kink, when viewed on a graph, could be explained by a period early on in the Universe’s history called the re-ionisation era. Atoms started forming from protons and electrons a few hundred thousand years after the Big Bang. The resulting gas cooled, creating stars, but the stars didn’t last long. They exploded in huge supernovae, sending energy out into space. This split the atoms back up once again, “re-ionizing” them. It’s unclear when the first stars started to form or when re-ionization started, but they’re important periods in the Universe’s history, because they set the ball rolling to create the galaxies we see today. The most widely accepted model says that galaxies are actually visible gas and dust coalescing inside larger haloes of a yet-to-be explained kind of mass called dark matter. Galaxies began forming with the first stars, but during the re-ionization period, astronomers think that temperatures rose too high, halting further galactic growth. Only at some later period, when large-enough dark matter halos coalesced, would the galaxy formation process pick up again. Maybe, thought the researchers, the satellite galaxies surrounding the Milky Way could provide a signal of this reionization era. 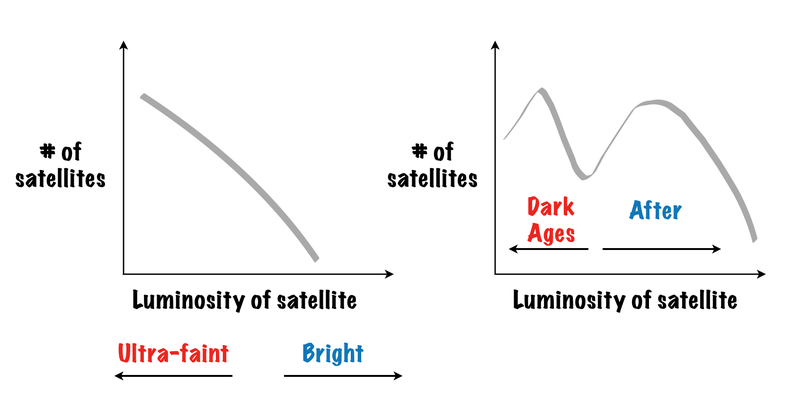 Small, dimmer satellites would have formed before the period, and brighter, larger galaxies would have formed afterward, with a gap in the middle representing re-ionization. The researchers developed computer models and simulations to predict how many dwarf galaxies there should be for given brightnesses, according to the paper published today in The Astrophysical Journal. Data from the Milky Way and our neighboring Andromeda galaxy fit the model. You may have heard the phrase “absence of evidence isn’t evidence of absence.” That’s the main caveat here—but there are theoretical models and other lines of evidence to back up the paper’s conclusions, Bose said. That includes the ages of stars in these satellite galaxies, the way that interstellar dust changes the light from the most distant sources, and other data points. They seem to be in agreement with the presence of the gap. But there are plenty of opportunities to take more observations and refine this result in the future.